This year marks the 175th anniversary of the original Croton Aqueduct system, which provided New York City with an abundant supply of fresh water. Officially dedicated in October 1842, the Croton Aqueduct system revolutionized the City. Did you know this remarkable piece of history also involves Central Park? In the early 1800s, the population of New York City was concentrated in lower Manhattan, mostly south of 14th Street. The streams and ground waters in the City had become polluted, and demand for water was rising. In 1832, a cholera epidemic in the City caused more than 3,000 deaths and more than 100,000 people to flee. Urban planners realized that for New York to achieve its goal of becoming a healthy city, access to a large source of clean drinking water was an absolute necessity. The City decided to build the Croton Aqueduct (an aqueduct is an artificial channel for distributing water) to supply New Yorkers with water from the Croton River, in what is now Westchester County. Built between 1837 and 1842, the Croton Aqueduct became the City’s first water supply system. Water traveled from the Aqueduct with the force of gravity to a Receiving Reservoir between 79th and 86th Streets and Sixth and Seventh Avenues (where the Great Lawn and Turtle Pond are today). The Receiving Reservoir was a rectangular tank with fort-like retaining walls. At 1,826 feet long and 836 feet wide, it held up to 180 million gallons of water. Built on high ground, the Receiving Reservoir held water that could easily flow to the Distributing Reservoir, a similar but smaller tank located on Fifth Avenue between 40th and 42nd Streets (where the main branch of the New York Public Library and Bryant Park are today). Water began flowing through the aqueduct on June 22, 1842. It took 22 hours for gravity to take the water the 41 miles to reach lower Manhattan. 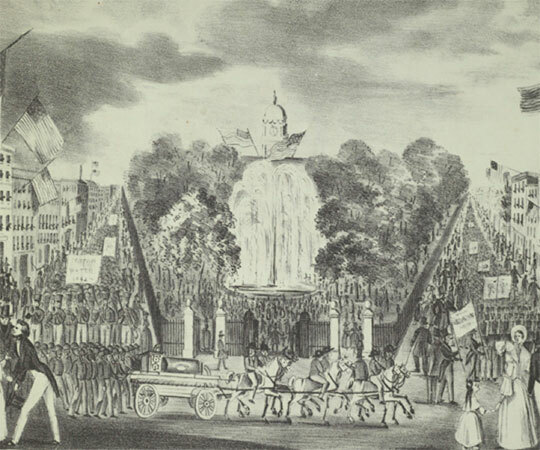 The official opening of the Croton Aqueduct was celebrated on October 14, 1842 in City Hall Park — even President John Tyler was on hand for the festivities. Though the Aqueduct was a huge hit and one of the most advanced engineering feats of its time, it was having difficulty meeting the City’s demand for water. Around this time, in 1853, state officials approved funds to purchase the land that Central Park was later constructed on — 59th to 106th Streets, between Fifth and Eighth Avenues. In April 1858, Frederick Law Olmsted and Calvert Vaux submitted plans to a competition (which they subsequently won) to design the Park. That same month, construction began on the Upper Reservoir (now the Jackie Kennedy Onassis Reservoir) as a backup supply for the Receiving Reservoir. It opened in 1864 and holds 1 billion gallons of water. Originally, the Upper Reservoir featured only one south and one north gatehouse, allowing 70 million gallons to enter from the Croton Aqueduct each day. This was deemed inadequate, so a New Croton Aqueduct system was constructed in the 1890s — adding a second gatehouse to the north end of the Upper Reservoir — that supplied it with 300 million gallons of water each day. A fountain in the Upper Reservoir — driven by hydraulic head pressure due to gravity — was installed in 1917 to commemorate the opening of the first water tunnel which negated the need for the original Receiving Reservoir. The Receiving Reservoir was then removed in the 1930s. The Upper Reservoir ceased providing water to New Yorkers in 1993 and was renamed the Jackie Kennedy Onassis Reservoir in 1994. In 2010, a Conservancy restoration included the installation of an electric pump that now runs a fountain in the Reservoir. If used today, the Reservoir would only be able to supply New Yorkers with enough fresh water for about one day. To grasp the size of the Receiving Reservoir that existed where the Great Lawn and Turtle Pond are now, walk north along the east side of the Great Lawn Oval. Notice the slight rise of the landscape on your right side — that marks the eastern wall of the Receiving Reservoir. Look directly across the Great Lawn — the tree line marks the western wall. The Receiving Reservoir ran from the 79th Street Transverse to the 86th Street Transverse Road. Central Park also contains a popular tribute to the Croton Aqueduct and its legacy. 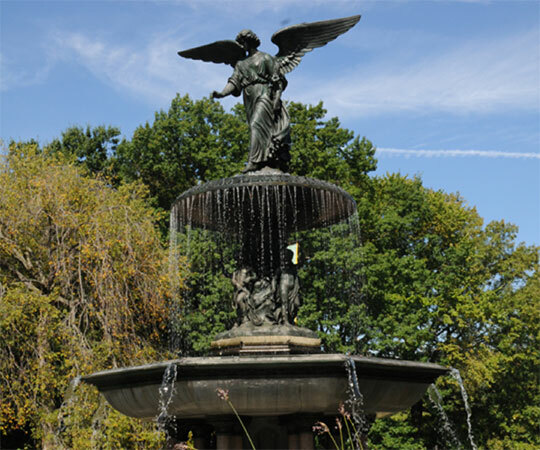 Sculptor Emma Stebbins dedicated her statue atop Bethesda Fountain, the Angel of the Waters, to the healing powers of pure Croton water. The statue, unveiled in 1873, references the Gospel of John, which describes an angel blessing the Pool of Bethesda and giving it healing powers. The angel carries a lily in her left hand and her foot touches the water — a symbol of the water’s purity. 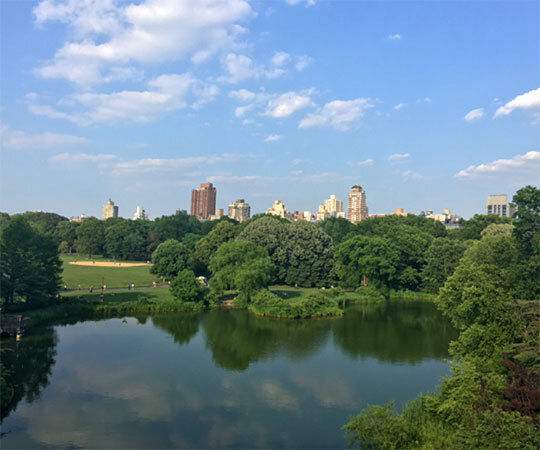 Whether you are taking a run on the Reservoir’s 1.58-mile track, visiting Bethesda Fountain, or enjoying a picnic near Turtle Pond, it’s worth reflecting on how much of the City’s history exists right here in Central Park. Thanks to Conservancy volunteer Ron Korcak for his contributions to this post.